A watercolour of a young woman seated at an artist's table in a pleasant interior. Just behind her is a view through a large open window over a river to buildings beyond. A blue-striped curtain has been drawn back on the right. In addition to his career as a prolific watercolourist and printmaker, Paul Sandby (RCIN 661138, 422520) worked as a drawing master to the offspring of several noble families, and this young woman is likely to have been one of his pupils. 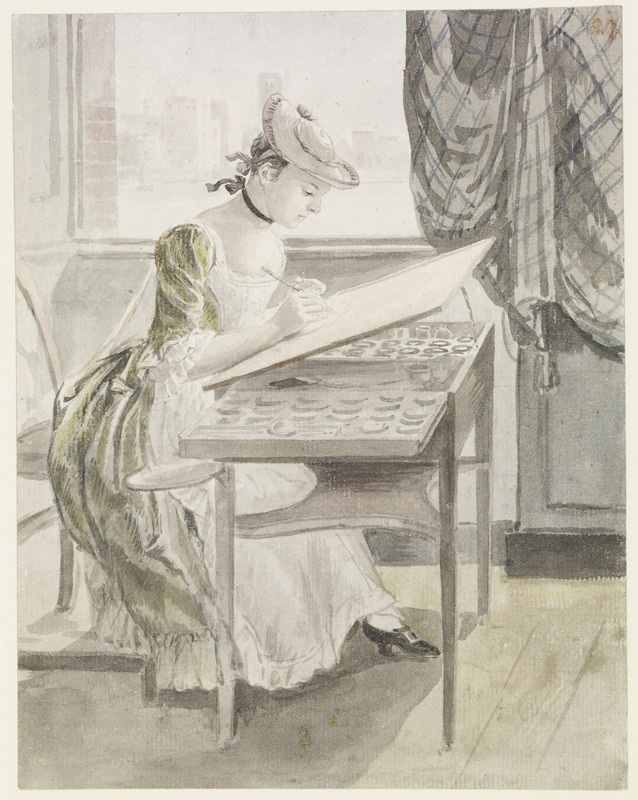 Sandby depicts his subject’s pastime as a pleasant, orderly and rational activity: she is seated in the light and airy interior of a large house, dressed in the fashions of the day, working at an ingenious artist’s table with an upper surface that could be raised to different angles, a side drawer allowing ready access to shallow bowls or shells for the mixing of colours and a larger flat palette attached to a leg of the table. The window gives a view across the Thames to Lambeth Palace, its gatehouse visible behind the young woman’s head. The building from which this view was taken has thus been identified by Richard Green (Burlington Magazine CLIV, May 2012, pp.312-5) as old Grosvenor House, which was leased after 1755 to the Northumberland industrialist John Delaval. Of Delaval’s five daughters, Green judged on grounds of costume and apparent age that the subject was most likely to have been Rhoda (1751–70; not to be confused with her aunt of the same name, who was an accomplished pastellist). In the Yale Center for British Art is a drawing (B.1975.4.1881) in red and black chalks that shows the same young woman seated at the same desk, copying with a porte-crayon from a portrait print.